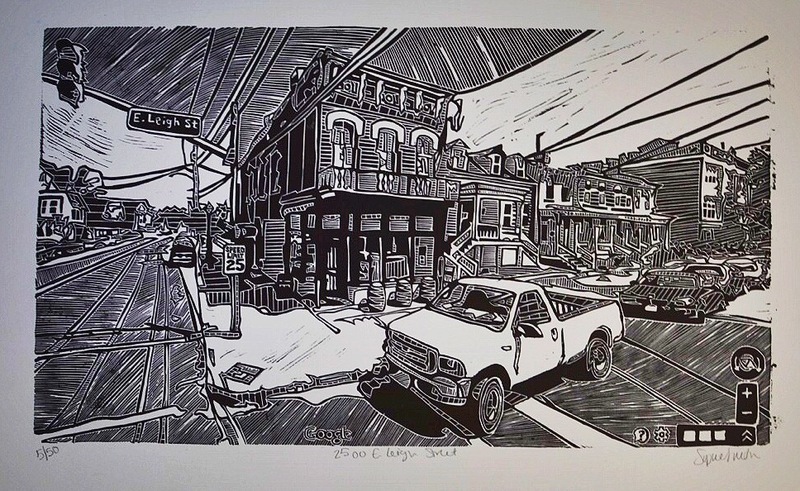 Very neat print of the Google Street View of 2500 block of Leigh Street posted today by Sophie Lynn Smith. What is the downstairs of this building used for? I feel like it could be a terrific location for a restaurant or any number of other businesses – doesn’t seem like much as it is now. I love this – my house is 2502 E. Leigh & want to contact Sophie Lynn Smith about getting a print. Would love to know if this is a woodcut. John, can you tell me how to reach the artist(I’m not on tumblr)? FYI – the Downstairs of 2500 is my neighbor’s office space. @3 Mary Anne, it’s numbered 5/50 so there must be others. I’ve send a message, I’ll let y’all know if I hear back. Thank you so much for the love! Im SO happy to be featured on this website. I have have her information. Sophie is in her first year of art school and is such a cutie. We have the print on our mantel. Stop by the office if you want to see the print or need her contact information.